A decade ago (in 2007-08), prior to the global financial crisis hitting D-street, the Indian initial public offerings (IPO) market gave a stellar show with overall ₹41,300 crore funds raised, making India the 5th largest market in volume and 7th largest in value terms. Then the capital markets crashed in after the global economic slowdown in 2008, and the numbers fell as low as Rs 2,030 crore. The consecutive years also saw a limited number of IPOs being filed by companies. However, 2017-18 saw the resurrection of the Indian IPO market. As many as 45 companies resorted to raise much-needed capital via the IPO route. A record of about ₹82,100 crore has been collectively raised by these companies - a whopping three-fold jump from previous years’ ₹28,200 crore and almost double the 2007’s IPO figure. Strong domestic liquidity, the resilient Indian economy, the surge in foreign institutional investors and improving investor sentiments have pushed the IPO charts northwards. 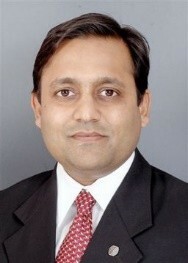 Prior to the global financial apocalypse that shook the world including India, the real estate sector was at its peak. Till then, the wave of financial liberalization allowed banks to give credit to large-scale borrowers – resulting in a sharp rise in foreign capital inflows and domestic liquidity. Post-2013, the story changed and the previous roar of Indian real estate first sank to a murmur - and then, more or less, fell silent. The liquidity crunch coupled with high inflation and execution delays compelled housing buyers to postpone their purchase decisions. This naturally impacted housing sales and property prices, leaving developers with huge piles of unsold inventory. Battling massive negative cash flows, many developers also failed to deliver their promised projects. Things worsened when high-risk provisioning was assigned to the real estate sector when various realty firms either defaulted or faced bankruptcy. Banks became reluctant to lend to developers as they were already burdened with non-performing assets (NPAs). IPOs as an alternate source for cheap capital also slowed down because of weakened consumer sentiments to the backdrop of deteriorating builder reputation who failed to live up to their promises, causing buyers to feel the brunt of delayed delivery of projects. Many builders then resorted to overseas funding, private lending and qualified institutional placements (QIPs) which allowed only listed companies to raise funds, and non-banking finance companies (NBFCs) which charged steep interest rates. 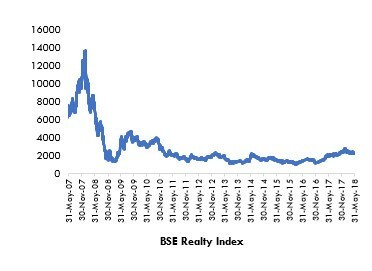 The BSE Realty index which reflects the performance of the top-listed real estate players was at its peak until 2008. After that, the index witnessed a slump due to weak macroeconomic conditions, rising unemployment and declining real estate demand. However, the recent spate of reforms including DeMo, RERA and GST have helped the market conditions improve due to increased transparency and accountability. With this, the realty index also seems to be heading north now. Till date, around 16 private realty players and two Government-owned real estate companies have opened their shares to the public. Of this, DLF (issued in 2010) owns the highest issue size of ₹9,000 crore till date. In the consecutive five year period, from 2011-16, there were no large-scale IPOs issued by big real estate players. The recent IPO filing by the Government-owned Housing and Urban Development Corporation (HUDCO) in May 2017 and National Buildings Construction Corporation Limited (NBCC) in April 2018 received manifold subscription due to their diverse businesses. While HUDCO emphasizes financing urban infrastructure and housing, NBCC has a hard focus on civil construction projects, civil infrastructure for power sector, and real estate development. To the considerable relief all stakeholders, the struggling real estate sector is now stabilizing to some extent. As a result, real estate IPOs are also gaining momentum. Reports suggest that Mumbai-based Lodha Developers Limited, Thane-based Puranik group and Bengaluru-based VBHC Value Homes are planning to raise funds through public offerings. One predominant factor contributing to this spurt is the improving economic parameters, including GDP growth rate. Also, RERA implementation in 2017 raised the confidence of investors and end-users of real estate. After decades of disorganized eccentricity, the Indian real estate sector is transforming into an organized one, with improving transparency and accountability providing a new ray of hope. Looking at the record-breaking number of IPOs in 2017-18, the current fiscal is also likely to remain robust with numbers suggesting that India Inc may collectively raise over Rs 2,00,000 crore in equity and equity-linked offerings – and IPOs take centre-stage. Real estate IPOs, which had taken a backseat over the last few years, are once again getting ready to ride the revival wave. ANAROCK’s research also clearly highlights the increasing real estate absorption momentum with a Q-o-Q rise in housing sales across the top 7 cities. The stage is set and the actors are primed for a massive IPO push over the next few years.